Are you planning a remodeling or addition project? Thinking about selling your home and building new? Where do you begin? Who do you talk to? 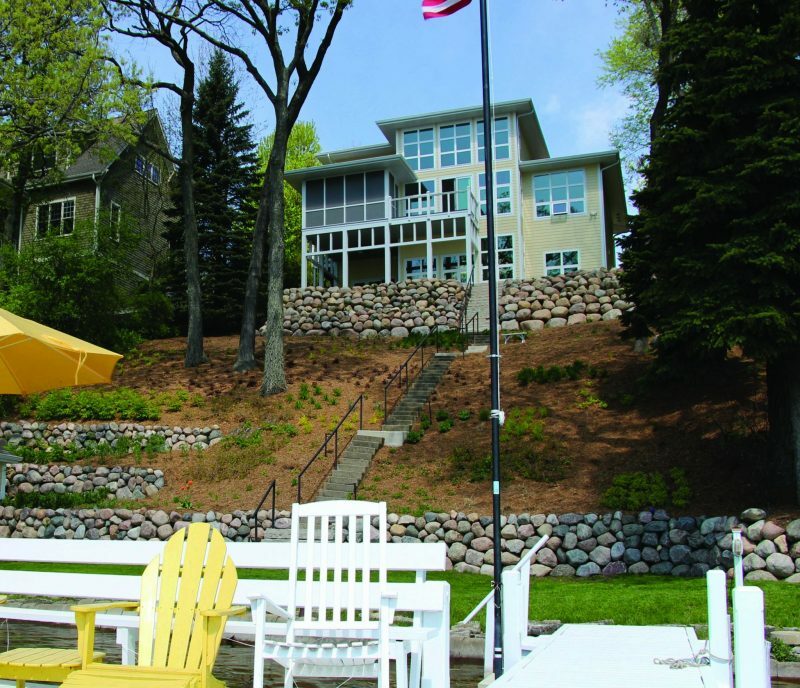 The perfect place to start is at the Lakeland Builders Association Home Improvement Expo, at the beautiful Ridge resort in Lake Geneva, January 27-28. This conveniently located venue has plenty of parking for guests. It’s a great place to start your 2018 plans for home improvement, or building a new home! All under one roof. There will be lots of timely and interesting seminars too. You’ll bring your home from ordinary to extraordinary! Tickets are $5 each. Children 12 and under are FREE. Want to get FREE admission? Simply print this page and bring it to the Expo for TWO FREE TICKETS! Our compliments. Stop by and say Hi. We’ll be at Booth #303 – by the fireplace! Randy Thelen was recognized as LBA 2016 Builder of the Year, a reflection of the Thelen Total Construction’s active role in the organization throughout the years. We consistently supported LBA by participating in the Home Expo and the Parade of Homes, year after year. In addition, Melody Fehling, office manager at Thelen Total Construction chaired the 2016 Parade of Homes committee, and serves on the LBA Board of Directors. 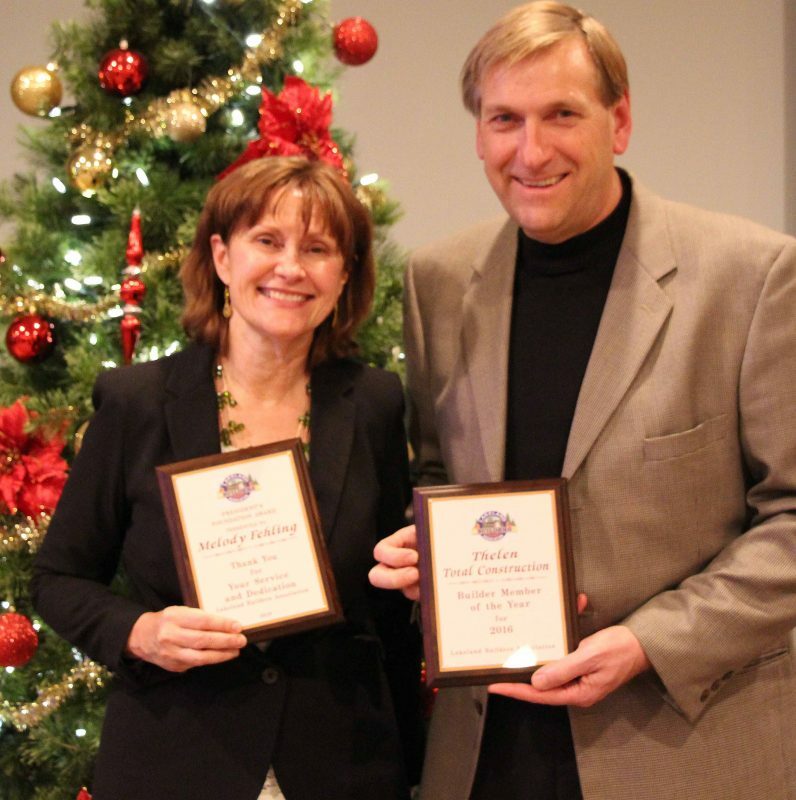 Traditionally at the Lakeland Builders Association’s Christmas party and officer installation ceremony, awards are given to members in three categories: Builder of the Year, Associate of the Year and Cornerstone Award. That night LBA’s first ever Foundation Award was given to Melody. Susan Keel, the 2016 President of LBA talked about how some members are the “foundation of an organization.” They are the go-to people when there is a question or a challenge. They are the people who give of their time unhesitatingly. They help move the organization forward in its goals. 2016 was a challenging one for LBA in which Executive Officer, Karen Mrozinski left for a career opportunity in May. The Raab Group was then hired to fill the Executive Officer role at LBA. Kathy Raab and her team are doing a great job with new ideas, experience and knowledge. During the transition, there’s a period of time needed to fully understand the member’s needs and what the goals are. Melody had a role in that –because of her close to two decades of involvement with LBA. Under the leadership of Bill Ruebl, incoming 2017 President of the Association, new challenges and opportunities await builders and associate members. We look forward to an exciting and prosperous new year! Jim Gage from Thelen Total Construction answering questions on home construction. 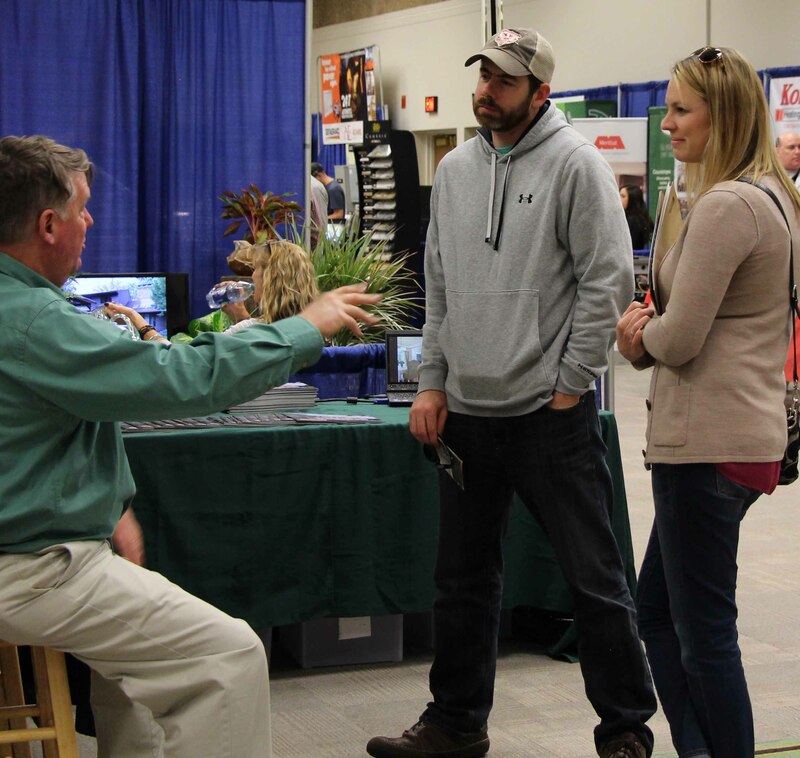 The perfect place to start planning your new home building or remodeling project is the 2017 Lakeland Builders Association Home Improvement Expo, which will be at a NEW location – The Ridge Resort in Lake Geneva on January 28-29. This conveniently located venue has plenty of close parking for guests. Check out the bold contemporary look of The Ridge. The perfect place to start your bold adventure in home improvement! All under one roof. As they tell you on late night TV commercials; “Wait! There’s more! There will be speakers and demonstrations to help you bring your home from ordinary to extraordinary. Tickets are $5 each. Children 12 and under are FREE. Want to get FREE admission? Simply print this page and bring it to the Expo for TWO FREE TICKETS! Our compliments. Stop by and say Hi. We’ll be at Booth 303 – by the fireplace! One highlight of the summer months is the Lakeland Builders Association Parade of Homes. Lakeland Builders Association and Thelen Total Construction have a long history together: At last count we’ve showcased 46 homes since the first LBA Parade of homes in 1989! More than any other builder. This year we will be featuring two homes; one on Pleasant Lake in the Elkhorn / Troy area, and one on Lake Beulah in East Troy. They are unique homes – personifying the style and features our homeowners wanted. The Pleasant Lake home is just under 2,000 square feet – quite a departure from the 11,500 square foot home we showcased last year on Lauderdale Lakes! It cottage detailing makes for cozy retreat on the lake. 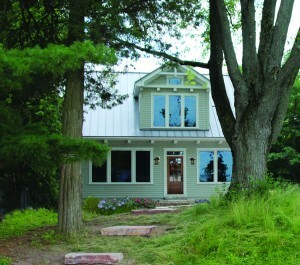 The Lake Beulah home is on a ridge overlooking the lake. Three stories of windows give you lots of natural light and inspiring lake views in this contemporary- looking lake home. Perfect, relaxing get-away cottage on Pleasant Lake. For more information on this home and other homes in the 2016 Lakeland Builders Association Parade of Homes, please visit the LBA website. Wanting more daylight in the kitchen prompts a shift in storage design. Delivering more daylight means less available wall space and that has translated to an increased interest in walk-in room pantry space. A really large pantry can serve as a secondary kitchen; also known as a “messy kitchen” , or a back kitchen – complete with cooktop, dishwasher, sink, prep space, floor to ceiling storage for canned goods, serving platters, oversize pots and pans, and space for caterers to set up. With open kitchens adjacent to living areas, a back kitchen provides a place to keep kitchen chaos out of sight when company comes. 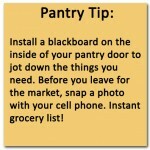 Convenience, accessibility, and “at a glance” visibility are the key attributes of a great pantry. 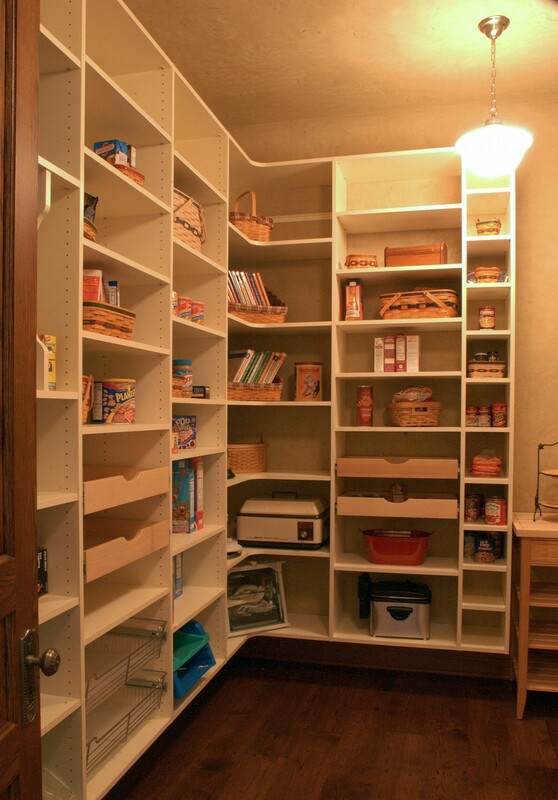 A walk-in pantry doesn’t need to be fancy since it’s behind closed doors. However, even if it’s only simple shelving, it’s a good idea to include a countertop for a landing zone. It’ll make it easier to stock items, provide extra place for food prep, and space for a blender, a stand mixer and a coffee maker. You can add as needed wall cabinets with pull-outs and built-ins. Other features can include pullout baskets for root vegetables, narrow cubbies for large platters, and nooks for cookware. 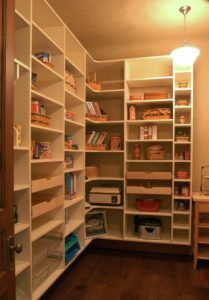 The pantry should be large enough to hold a week’s worth of groceries and close enough to the food prep area. Organization and the right location are more important than size alone though. Ideal lighting illuminates every shelf evenly, so be sure to install quality LED lighting. A skylight is a great idea if the home design allows. And make sure the light switch is in a spot by the pantry door. Whether your pantry is built-in cabinetry, a butler’s, a walk-in, or a combination – storage is never in short supply, and your kitchen layout is optimized for maximum efficiency. What is the cost-per-square-foot of your homes?